In the first strike of charter school teachers in the nation’s history, 500 staff members walked off the job from Chicago’s Acero Schools charter network Tuesday morning after negotiations broke down overnight. The strike forced the network to cancel class for more than 7,000 students in its 15 schools across the city. The teachers’ demands include higher pay, more teacher diversity, more special education staff, smaller class sizes, and a shorter school year. They also want all 15 schools to be declared “sanctuary schools,” which would prevent the network from sharing students’ information with federal authorities and would bar federal agents from entering the schools without a warrant. More than 90 percent of Acero’s students are Latino. Critics have said teachers should be wary of aligning themselves with a union that has consistently fought against charter schools. Andrew Broy, president of the Illinois Network of Charter Schools, called the union’s push for a strike a “bait and switch” and said charter teachers joining unions could lead to “the same restrictive contracts that prevent progress in public school generally.” Research shows that Chicago’s charter schools outperform the city’s traditional district schools on several measures. Although no classes were held Tuesday, the schools were open for students who needed somewhere to go during the day, and breakfast and lunch were served, according to the network’s website. “The sad fact is that interests from outside our community are using our students and our schools as a means to advance their national anti-charter school platform. They don’t want our schools to succeed because it doesn’t serve their agenda,” Acero Schools CEO Richard Rodriguez said in a statement posted online. 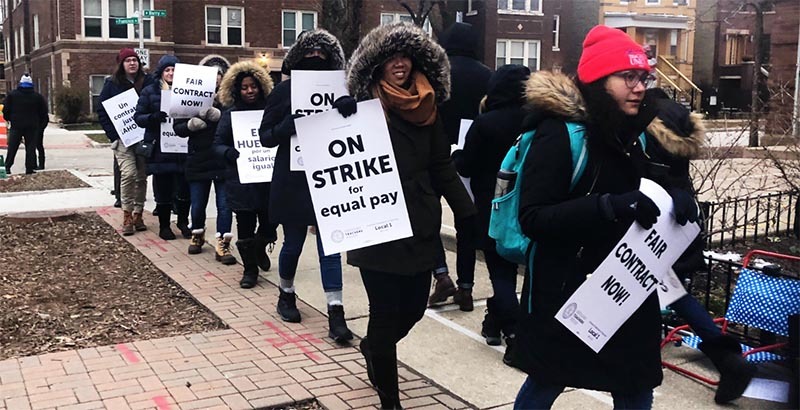 Nationally, the vast majority of charter school educators do not belong to unions, but Acero teachers unionized in 2013, joining the Chicago Teachers Union, an American Federation of Teachers affiliate. AFT president Randi Weingarten joined the teachers on the picket line Tuesday. The strike caps a year marked by statewide teacher walkouts in several states where, in many cases, teachers were demanding higher pay, more classroom resources and support staff, and more state funding for education overall. “This activism is contagious,” Weingarten said. The Chicago Teachers Union president, Jesse Sharkey, said Tuesday morning the strike will continue until an agreement is reached. Here’s what the demonstrations looked like.